My computer doesn't always detect the DS3 when it's not installed. Sometimes it shows up as some default pad, sometimes nothing. Yeah I did. It wasn't detected on my Ubuntu drive either. I'm going to first get a new mini-usb cable to see if that's the issue, if not, I'm trading in the controller. xbox SA to the rescue! Another improvement being proper keyboard controls when using IV controls (non-1 ControlsSet in general) - I also have an idea how to fix this, but haven't started it yet. It's not up to me - it's your responsibility to ensure your controller works fine via XInput. As noted, you can use x360ce if your controller is a DirectInput one. What is the latest version of x360ce that supports windows xp? And does anyone have it? Thanks. So i assume you are using something like rawInput rather than xinput / directinput to allow the playstation pressure sensitive buttons to work. (As both don't support enough axis in a single controller to make it possible unless you map 1 controller to 2 controllers :S). If you don't have one i can go through the diff values. So i assume you are using something like rawInput rather than xinput / directinput to allow the playstation pressure sensitive buttons to work. No, that's an API extension exposed by SCP driver. Without the driver and a compliant xinput1_3.dll, pressure sensitive buttons don't work. This driver is ancient... too old even for me to support it. Besides, I'd like to avoid messing with raw controller data in GInput - mod's purpose is to use a different API, not to mess with low level data like this. Oh okay so they process the raw input for the pressure sensitive buttons already and expose them to you as an extra part of their driver seperate from the xinput stuff. I thought the purpose of this mod was to match the games up with the console versions in terms of controls, that's why i suggested it. Mind you, do the original xbox games actually use pressure sensitivity for anything on console apart from driving? And even then, that's only if you change the control scheme not to use the analogue triggers for driving. Maybe san andreas might - i haven't played that on xbox. But yer, you wouldn't have to do do the whole controller input that way, just the 6 buttons. If xbox emulation ever gets up to speed maybe someone will have done it for you as part of their emulator. In fact maybe they already have? But yes you're right, it would be writing additional functionality for specific controllers. The only reason i mentioned it was because you had done the same for playstation, although i wasn't aware it was already mapped for you. If it makes any difference the pressure sensitive buttons do seem to be listed fairly straightforwardly in the raw data packet - just 1 byte each. Is there any way to make it so that in gta 3 for example you can use the controller to drive, fly and walk with the analogue stick, but still the mouse to aim and shoot - getting the best of both worlds? And if not possible in gta 3 is it possible in any of the games? Or at least to be able to have both controls active at once and seamlessly switch on the fly if you touch the keyboard or controller then switch control method for example (although that wouldn't help for analogue character movement). It's kind of stupid how in gta iv and v they dumbed down the player movement so you can't even walk by tilting the analogue stick a smaller amount. You may as well not even be using an analogue stick in those games Same for RDR. You can use Classic AXIS for that. It's still in development right now, though, so expect minor (major) bugs. Mind you, do the original xbox games actually use pressure sensitivity for anything on console apart from driving? No, xbox treats all buttons as digital (even though original xbox input API was designed as if they were pressure sensitive, games were not supposed to assume so and API only returned digital values). The purpose of GInput is to make III/VC/SA have controller support on par with modern titles, I never aimed for 100% accuracy with console versions, especially since they also have their flaws which I'm trying to correct. Seamless switching between keyboard+mouse and pad is already a thing since the first release, although it tends to be glitchy for controller settings other than 1. However, by now I know how to fix that and the next GInput release will see it fixed. It feels like there is something smoothing / filtering your inputs. You cannot steer quickly or tightly. You can't slam on the brakes and lock them easily. You can't flick the car around with the handbrake anywhere near as much - although this might be due to the problem with it not turning properly. It's like when you press turn, you are sort of "requesting" the game to turn. Play the xbox game with standard controls and you will really see the difference. BTW when you say the xbox version treats all the buttons as digital, that is completely untrue - if you set the contols to classic, then the accelerator and brake use the buttons and they use the pressure sensitivity. If you press them lightly it accelerates / brakes lightly, harder then it does the same but harder. For both the analogue triggers and the buttons (standard controls and classic controls) on xbox, it seems like there are 3 input levels, but i could be wrong. At least, there are 3 engine sound levels for the accelerator depending on input. They are: no input, slight input and full input. For turning, it is obviously harder for me to gauge this, however the turning is much more responsive in the xbox version. Really, the cars feel responsive and twitchy and let you throw them around, lock wheels and get them unstable on the xbox. On pc, with gamepad controls, either using the default game direct input or your ginput, it feels sluggish and filtered and not correct. If i get around to trying the ps2 version i will report back from that too but I have a feeling it will feel like the xbox version. For me, my hypothesis is that they filtered the inputs for keyboard controls and that when you switch to analogue controls, this isn't taken into account. At least, they seem to be doing something different on pc - whether it is your plugin or the game itself i don't know but it's way less fun. That even regards face buttons? If I recall correctly. only triggers were treated as analogue... I'd have to check again. The differences you describe though don't sound too plausible. I don't recall seeing any explicit filtering of input - the differences may very well come from outside the game (x360ce/your gamepad/drivers). Either that, or you're playing with frame limiter off which screws with physics a lot. Deadzones nor triggers are not 1:1 to xbox/ps2 and they never meant to be - that however shouldn't make them less responsive. Quite the opposite, GInput analog sticks are meant to be more intuitive to use than PS2/xbox one. You can see the difference when you're barely touching the sticks - on PS2 those tiny movements will have a noticeable jump once you get over deadzone, whereas GInput smoothens those. Full press/turn should be identical. Hmm yes i will do more testing and let you know. Maybe it is partially to do with the "jump" after you get past the deadzone that you have removed. Maybe that could be optional. Of course you're right, deadzone etc effects things - do you know what deadzone settings the game (or xbox system) uses for each stick / trigger / button? In classic control mode on xbox, it definitely uses the buttons as analogue. An easy way to see this is to take a car that can easily lock its wheels under braking like the stallion, get up to a decent speed and press the standard brake button lightly - it will not lock its wheels. Try again and press the button hard and it will lock its wheels. It seemed right for engine note during normal driving BUT... go somewhere quiet with tarmac turn off the radio and stop the car. Hold the handbrake button and then modulate the throttle. You will hear that you can keep the throttle in a specific position and the engine note will vary accordingly as the car creeps forward. So at least for the sound it seems to treat it as analogue rather than segmented (well of course it is still segmented into 256 or however many steps but ). You can hear this with both the trigger and button controls. It would be useful to provide an xbox controller layout though because it is super hard to do drivebys with how it is now, as the white and black buttons aren't easy to use like that. I can provide detailed instructions later on the control mappings (and maybe suggestions for slight improvements). It isn't too different from the gta iv setting but enough to make it awkward. Interestingly, there seem to be more player movement speeds than i realised! I thought there was just walk and jog (and sprint) but no! In fact there is a slow walk, a brisk walk and a jog depending on how far you push the stick. (Of course sprint too if you press the button). This is a completely random question but is it possible to define what sound files in the sfx.raw / sdt that pedestrians use? There are LOADS of them that have sound files in the game but they seem to be unassigned and therefore unused. So a lot of peds are silent when you threaten them with a gun or other things happen to them etc. It would add so much life to the game if this could be fixed / properly assigned. Is it all hardcoded? Is there a way it could possibly be done via scripting etc? Just to confirm again, you're not playing with Frame Limiter OFF right? That WILL affect how the physics work, especially in GTA3. Ah! My reference to pressure sensitivity was SA xbox - maybe III xbox really treats them as analog. Yes, i'm not playing with the frame rate limiter off - only vsync off (frame sync). Hmm i haven't tried san andreas xbox but if i do for testing i will let you know. I think it is very different from 3 / vice city though, because i remember my friend saying the control scheme for drivebys on it was quite difficult. 3 and vc are very similar in control on xbox. Interestingly, it also gives FFB format description too for both the left and right motors. With the version of x360ce i have working on xp the FFB motors aren't working seperately but maybe with newer versions that is fixed. (A problem with x360ce i think, not your code). I thought i would have a look at documenting the xbox controls for you. There are two control schemes, standard and classic. Standard is most similar to your gta iv controls. In relation to your ginput controls, white corresponds to the left shoulder button and black the right shoulder button. When operating the turret while moving, the camera stays facing forward. When stationary, the camera follows the turret. When operating the turret while moving, the camera follows the turret but ONLY allows rotation as far as the side of the vehicle. If you spin the turret around the back of the tank then the camera will stay locked to the side of the vehicle until it gets to the other side, at which point the camera will spin around (briefly viewing the direction of travel) to show the other side of the vehicle. When stopped OR moving slowly (i guess approx 20 mph or less?) the camera will follow the turret at all times. If camera position / turret is viewing behind and then you speed up, as long as you don't move the turret again, the camera position will stay facing rearward until you touch the right analogue stick. Can driveby with the turret (as look around is the dpad), however turret and driveby are the same button, so when you press it it fires both the uzi and the turret. In vice city you can't look around while in a vehicle with a turret even with classic controls, so you cannot driveby in them. There is very little deadzone where analogue triggers are used as buttons (almost none at all). The deadzone on the rightstick for car viewpoints and firstperson "look mode" view is way too large. Is this a bug? It seems like this is either hardcoded by you or you are not taking the ini file deadzone into account? At least the "look mode" shouldn't have a massive hardcoded deadzone. The amount of time allowed to press the left stick button in order to turn the siren on or off is way too short and means that it is very easy to do the wrong thing. It is slightly longer on the xbox. The deadzone for the analogue trigger pressing to fire your weapon is way too large (about half the trigger movement!). On the xbox it is almost non-existent, at least very small, which makes timing shots easier. Still, a button would be preferable. The aiming / first person view controls are way more sensitive on the horizontal axis than the vertical axis, making it really difficult to control. It would be good if both axis used the same "movement speed" or at least if it was configurable. For some reason, in the right stick "look around" mode, the viewport moves way quicker than in the aiming view - particularly the horizontal axis. 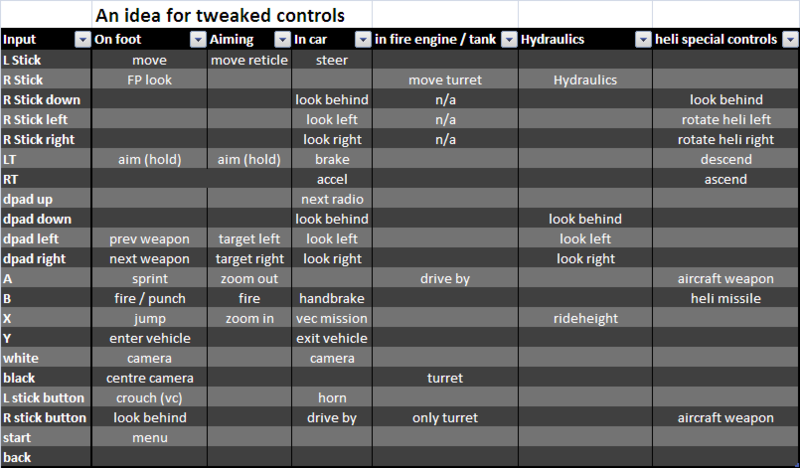 I've had a go at tweaking the standard xbox controls to try and get around some of their pitfalls - mainly, not being able to look around in vehicles with turrets, not having analogue hydraulics and not having the option to use a button rather than a trigger to fire / punch. Things like using up on the dpad to change the radio could be optional and that functionality could be duplicated to the (otherwise unused) back button). Of course it would require the ability to change controls depending on the vehicle that the user is in (so that the right stick changes from look around to turret for example in a fire engine or tank). Things that are part of the xbox controls, like the camera following the turret depending on speed are really nice and necessary features. Bear in mind a lot of the functionality that is "easy" with the 360 controller is very hard to do on the original xbox controllers due to the lb and rb being face buttons and so difficult to press in combination with others. Any questions, clarifications or anything i've missed, just ask. If anyone wants the excel document i can upload it somewhere, just ask. Keep in mind that originally we decided against original Xbox controls because majority of people used a 360 controller (OG Xbox controller had no pc version at the time) and it seemed odd and a waste of time to add a control scheme that was similar to IV style ...but worse on a 360 controller. It's only recently that I've hinted that perhaps OG Xbox controls should be added since the re-release of the controller. It is FPS related for sure. Yes i understand, however a lot of these issues are irrespective of original xbox controls - things like the right stick deadzone when looking around. Also the triggers have massive deadzones and there is no option in the ini file to remove them. How the camera follows the turret on specific vehicles on xbox is a real improvement too. In the end, it's always best to try and make things as configurable as possible, especially in terms of deadzones etc but also button layout. Hardcoding only leads to issues for people. I appreciate that allowing the control layout itself to be completely configurable might be annoying. However my tweaked controls at least allow things like looking around at the same time as moving your turret / hydraulics and avoiding any loss of functionality - something that none of the ginput controls currently do. In fact atm, control layouts 1 - 4 of ginput are kind of a bit pointless they don't use analogue input for throttle / brake. 5 (the gta iv style) and the sixaxis pressure sensitive buttons at least allow for this but it seems strange how there are so many configurations of this and only 1 of the analogue style controls. No, it's not fps related - i always keep the frame rate limiter enabled. The problem is, i am using a controller for the horn button. It takes significantly longer to press and release the analogue stick button than it does a keyboard key, due to the force required. On the xbox, for vehicles with a siren, the delay tolerance between siren on/off and horn is probably about 0.3 seconds. For GInput it is probably about 0.1 seconds. Of course i haven't actualy timed this so those are just approximate figures. In fact i find that the time is a little longer than necessary on xbox but it is no big deal. With Ginput, i find myself triggering the horn / siren horn (whatever you call the angry siren) a lot while trying to turn the siren on or off. I am not asking for the delay tolerance to be hardcoded longer but just make it an option in the ini file or something. It is always better to make things user configurable and then give example configurations (perhaps in the readme) for specific circumstances. If you require any more help or info, just ask. So I FINALLY got a cable working with my controller, and the mod works wonderfully... except for rumble feedback. (I don't get any) It's set to 1 in the ini config, so I don't know why it shouldn't be working. Those sound like Xbox improvements not present on PS2 - in which case I'm sadly not going to implement them. Camera following turret sounds cool, but it's not something which is present in the original version of the game (Xbox one is something you could call a "remaster"). Sounds like another Xbox difference. Deadzone is indeed big, but last time I checked it on PS2 it was identical. I did not special case anything for those, so anything you see is stock game behaviour. Stock behaviour, not affected by GInput - so if it's different, it's yet another Xbox change. GInput is not even "aware" of this functionality, game handles it at a different level to the level GInput is operating. Those come straight from PS2 (were left in the code, but unused). I'm not going to question whether they are useful or not, but since they were in, they are now available (with a few fixes, iirc one of the setups automatically exploded RC Bandit as soon as the player tried to accelerate...). In the end the main thing is to try and get the game controlling well - that's why I suggested a tweaked layout based on my own thoughts. You have to realise that the controls are designed around the controller. The PS2 controls rely heavily on the pressure sensitivity of the buttons as it has no analogue triggers where as on the pc side, there is no such thing as an interface for those analogue buttons with most people's controllers. The camera following the turret really does help but i can see that it might be a pain to implement. With the horn siren thing, it is more an annoyance than anything but at least it isn't major. If a button mapping similar to the tweaked suggestions could be implemented it would help a lot. I have tried to make it so the user is able to do any action they want easily without being hamstrung by the controls. Decoupling look around and turret controls completely. The suggestions are probably not perfect but i am open to suggestions. Configurability is the main way to get controls that suit every player. At the very least please allow the user to specify the right stick deadzone (atm the setting the user supplies doesn't seem to be taken into account) and the analogue trigger deadzones. I don't even understand why the analogue triggers have so high (it seems like 50% almost!) deadzones since there were no analogue triggers in the playstation version. Still, this is a very good and important mod that puts rockstar's original game controller controls to shame! I don't even know how the axis are configured for the original directinput controllers in gta 3 and vc because it isn't listed anywhere and is hardcoded! Obviously the x and y are movement but i don't know how they use z, rx, ry, rz etc for. It's only the buttons you can change! In fact i think with the standard keyboard and mouse controls on pc, you can't "threaten" people as you can't lock onto them. I have no idea how you are meant to hold up shops in vice city with those controls! Did you recode the FFB yourself or was it still present but just disabled?